The U.S. government reported a five-fold increase in the number of electronic media searches at the border in a single year, from 4,764 in 2015 to 23,877 in 2016.1 Every one of those searches was a potential privacy violation. Our lives are minutely documented on the phones and laptops we carry. Our devices carry records of private conversations, family photos, medical documents, banking information, information about what websites we visit, and much more. Moreover, people in many professions, such as lawyers and journalists, have a heightened need to keep their electronic information confidential. How can travelers keep their digital data safe? The U.S. Constitution generally places strong limits on the government’s ability to pry into this information. At the U.S. border, however, those limits are not as strong, both legally and practically. As a matter of the law, some legal protections are weaker – a fact EFF is working to change. As a matter of practice, border agents may take a broad view of what they are permitted to do. Border agents may attempt to scrutinize the content stored or cached on your phones, laptops, and other portable electronic devices, including electronic communications, social media postings, and ecommerce activity. Moreover, agents may seek to examine your public social media postings by obtaining your social media identifiers or handles. As of this writing, the federal government is considering requiring disclosure from certain foreign visitors of social media login credentials, allowing access to private postings and “friend” lists. This guide (updating a previous guide from 20112) helps travelers understand their individual risks when crossing the U.S. border, provides an overview of the law around border search, and offers a brief technical overview to securing digital data. As an initial matter, readers should note that one size does not fit all. We are deeply concerned by invasive and even abusive practices of some border agents, and we are well aware of the serious consequences some travelers may face if they run afoul of a border agent. Many groups, including EFF, are working to establish clear legal protections to help alleviate that fear. In the meantime, however, we know that some travelers will want to take a highly conservative approach, while others will be less concerned. This guide is intended to help you make informed choices according to your situation and risk-tolerance. Before your trip. Travelers should decide whether they can reduce the amount of digital information that they carry across the border. For example, they may leave certain devices at home, use temporary devices, delete content from their devices, or shift content to the cloud. Travelers should protect the information they do carry over the border. Most importantly, they should use full-disk encryption and backup their data somewhere else. Also, shortly before arriving at the border, travelers should power off their devices, which will resist a variety of high-tech attacks against encryption. Travelers should not rely solely on fingerprint locks, which are less secure than passwords. At the U.S. border. Agents may ask travelers to unlock their devices, provide their device passwords, or disclose their social media information. This presents a no-win dilemma. If a traveler complies, then the agents can scrutinize and copy their sensitive digital information. If a traveler declines, then the agents can seize their devices, subject the traveler to additional questioning and detention, and otherwise escalate the encounter. After your trip. If you feel that U.S. border agents violated your rights by searching or seizing your digital devices or online accounts, please contact EFF at borders@eff.org. Also, write down everything that happened as soon as possible. Your rights at the border. Compared to people and police in the interior of the country, border agents have more power and people crossing the border have less privacy. But the border is not a Constitution-free zone. The powers of border agents are tempered by the First Amendment (freedom of speech, association, press, and religion), the Fourth Amendment (freedom from unreasonable searches and seizures), the Fifth Amendment (freedom from compelled self-incrimination), and the Fourteenth Amendment (freedom from discrimination). Government policies and practices at the border. For many years, the federal government has asserted broad powers at the border to search and seize travelers’ digital information. These intrusions are growing in frequency and intensity. Finally, Part 3 is a primer on the technology of privacy protection. To secure our digital lives, we often must rely on (and understand) encryption, passwords, effective deletion, and cloud storage. In Part 1, we highlight some of the ways you can use these tools and services to protect your privacy. Part 3 offers a deeper dive. 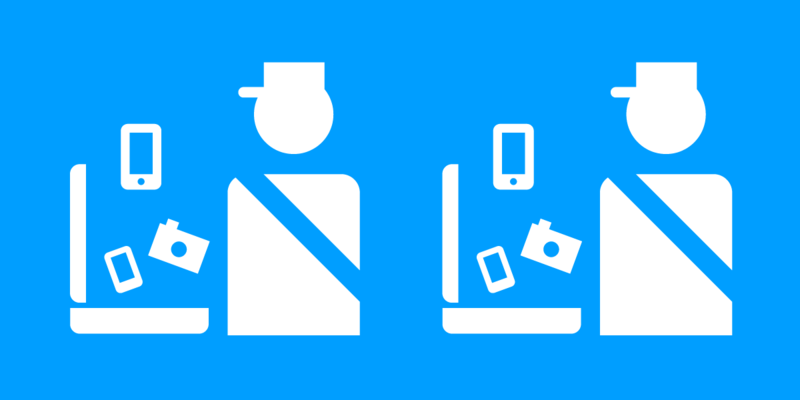 Want to help EFF protect everyone’s digital privacy at the border? Contact your U.S. senators and representatives, and ask them to support legislation requiring government officials to get a warrant from a judge based on probable cause of criminal activity before searching digital devices at the border. Also, please join EFF! Note that while certain messaging apps provide end-to-end encryption, if a border agent has access to your app, they will be able to see your cached messages in plain text within the app itself. When you arrive at the border, agents may seek access to your device by demanding that you type in your password, tell them your password, or (if you use a fingerprint key) press your finger to the sensor. This will give the agents access to information you store on your device. Border agents may also ask you to disclose your social media identifiers, which would allow them to scrutinize your public social media content, even if they do not have access to your devices. If proposals being floated as of this writing are adopted, border agents may ask for your social media login credentials (usernames and passwords), which would allow them to scrutinize your private social media content. Given that digital devices like smartphones and laptops contain highly personal information, are border searches of digital devices “routine?" There is some legal uncertainty at the moment, but we believe the final answer is no. Searching Cloud Content By Using Travelers’ Devices? CBP’s 2009 policy on device searches authorizes border agents to search, without a warrant or any individualized suspicion, “information encountered at the border.”97 This logically would include cloud content encountered by searching a device at the border. Many news reports have described border agents scrutinizing social media and communications apps on travelers’ phones.98 This a strong indicator that agents have, in fact, used travelers’ devices to search cloud content. In October 2017, the nominee to serve as CBP Commissioner testified that to implement the new no-cloud policy, border agents must “ensure that network connectivity is disabled to limit access to remote systems.” 101 This probably means that border agents should place devices in “airplane mode,” or toggle off cellular data and Wi-Fi. It could also mean that agents should bring devices to a SCIF-type room102 that blocks electromagnetic signals. EFF remains concerned that border agents may in practice conduct cloud searches, notwithstanding the CBP muster against doing so. If you think a border agent used your device to search your cloud content, please contact EFF at borders@eff.org. EFF and many other digital liberty organizations objected to this new policy.106 Among other things, it invades the digital privacy of both foreigners and the U.S. citizens who communicate with them, and it may provoke other nations to impose the same burdens on U.S. citizens. As of this writing, government officials are also considering new policies that would further expand CBP scrutiny of travelers’ cloud content, including mandatory disclosure of private, password-protected social media information.108 These dangerous policies, if adopted, could easily be expanded to cover all travelers. The encryption technologies that are available to you will depend on your device and operating system. If it is available, the safest and easiest way to encrypt is to use built-in full-disk (full-device) encryption, as opposed to encrypting individual files or virtual folders on a device.109 It is also possible that full-disk encryption was turned on automatically when you activated the device, as is the case for many recent smartphones. If that is true for your devices, you may still want to upgrade the strength of your password to maximize the security benefits. On most systems, if encryption is not already enabled,117 you can do it yourself. You will be prompted to provide an encryption password. It may be different from the password you ordinarily use to log in or unlock the screen, and is sometimes only required when you power on the device. These details vary significantly from device to device. On some devices, such as iOS devices, your encryption password is always the same as your regular unlock password, and it is used both to unlock the screen and to decrypt the storage media. A risk of encrypting your device is that nobody (including the device maker!) will be able to grant you access to your device if you forget your password. This is worth repeating because it is a very significant risk: Forgetting your encryption password will permanently lock you out of the data on your device, and a technology specialist or manufacturer cannot bypass this. This risk of losing access to your data makes it especially important to make regular backups.118 If you do not use your encryption password regularly, you may want to write it down somewhere.119 However, if you do not plan to unlock your device if border agents ask, you should not carry a copy of the password with you when crossing the border. Smartphones and tablets offer a “factory reset” feature that is designed to be used before you give or sell the device to another person.120 These features are getting better over time in terms of the amount of data they remove. When used on an encrypted device, they may succeed in removing substantially all of the information from the device, although border agents could regard this as suspicious. A laptop can wipe its own hard drive, or removable storage media like USB drives or SD cards, by overwriting their contents.121 One method of doing this is formatting the storage medium, but note that this term is applied to two very different processes: only “low-level formatting” (also called “secure formatting” or “formatting with overwriting”) actually erases the hard drive by overwriting data, while “quick format” or “high-level format” does not do so. Formatting tools let you choose between a quick format and a secure overwriting format. You should already have built-in tools that can already perform a low-level format or wipe a hard drive, or you may download third-party tools to do this. You should refer to the instructions for your operating system for securely wiping the hard drive. Some kinds of storage media based on flash memory technology have special issues124 related to forensics and data recovery. These include SD cards, other memory cards used in cameras and mobile phones, USB flash drives, and some laptop solid-state drives (SSDs). If you are concerned about it, consider overwriting flash memory devices multiple times, not carrying them across the border, or consulting an expert on storage technology or computer forensics. 95. Riley v. California, 134 S. Ct. 2473, 2491 (2014) (holding that police use of a device to search cloud content “would be like finding a key in a suspect’s pocket and arguing that it allowed law enforcement to unlock and search a house”); U.S. v. Cotterman, 709 F.3d 952, 965 (2013) (“The digital device is a conduit to retrieving information from the cloud, akin to the key to a safe deposit box. Notably, although the virtual “safe deposit box” does not itself cross the border, it may appear as a seamless part of the digital device when presented at the border.”). 96. Title III of the Omnibus Crime Control and Safe Streets Act of 1968, 18 U.S.C. §§ 2510-2522. 97. CBP, Border Search of Electronic Devices Containing Information, Directive No. 3340-049 (Aug. 20, 2009), sec. 5.1.2, https://www.dhs.gov/xlibrary/assets/cbp_directive_3340-049.pdf. 98. See, e.g., Gillian Flaccus, Electronic Media Searches At Border Crossings Raise Wor-ry, AP (Feb. 18, 2017), https://apnews.com/6851e00bafad45ee9c312a3ea2e4fb2c/electronic-media-searches-border-crossings-raise-worry; Mike Sorrentino, U.S. Border Agents Checking Facebook Profiles, Lawyer Says, CNET (Jan. 29, 2017), https://www.cnet.com/news/border-patrol-agents-checking-facebook-profiles-trump-immigration-ban/; Lisa Fernandez, Oakland Green Card Holder Describes SFO Detention As “Torment,” NBC (Jan. 30, 2017), https://www.nbcbayarea.com/news/local/Oakland-Green-Card-Holder-Reports-Being-Questioned-Detained-How-Many-More-Are-We-Not-Hearing-About-412429423.html. 100. EFF, CBP Reveals How Agents Implement New Policy Not to Access Cloud Content (Nov. 27, 2017), https://www.eff.org/deeplinks/2017/11/cbp-reveals-how-agents-implement-new-policy-not-access-cloud-content. 101. Hearing to Consider the Nomination of Kevin K. McAleenan to be CBP Commission-er, Questions for the Record, U.S. Senate Committee on Finance (Oct. 24, 2017), https://www.eff.org/document/qfr-kevin-mcaleenan-senate-finance-committee. 102. Andrew Rafferty, What Is a SCIF and Who Uses It?, NBC (Apr. 7, 2017), https://www.nbcnews.com/politics/politics-news/what-scif-who-uses-it-n743991. 103. U.S. State Dept., Visa Waiver Program, https://travel.state.gov/content/visas/en/visit/visa-waiver-program.html. 104. CBP, ESTA application, https://esta.cbp.dhs.gov/esta/application.html?execution=e1s1. See also 60-Day Notice and Request for Comments; Revisions of an Existing Collection of Information, 81 Fed. Reg. 40892 (proposed June 23, 2016), https://www.federalregister.gov/documents/2016/06/23/2016-14848/agency-information-collection-activities-arrival-and-departure-record-forms-i-94-and-i-94w-and. 105. As of this writing, the Trump Administration is proposing a similar policy for Chinese visitors to the U.S. See Josh Gerstein, Trump Proposes Including Chinese Visitors in Social Media Checks, Politico (Feb. 17, 2017), http://www.politico.com/blogs/under-the-radar/2017/02/trump-chinese-visitors-social-media-check-235146. 106. See, e.g., Letter from EFF to CBP (Aug. 22, 2016), https://www.eff.org/document/cbp-comments-final-aug-22-2016; Letter from Center for Democracy & Technology et al. (including EFF) to DHS (Aug. 22, 2016), https://cdt.org/insight/coalition-letter-opposing-dhs-social-media-collection-proposal/; Letter from Brennan Center for Justice et al. (including EFF) to DHS (Oct. 3, 2016), https://www.brennancenter.org/analysis/civil-liberties-coalition-submits-comments-dhs-plan-collect-social-media-information; Letter from David Kaye, U.N. Special Rapporteur, to Pamela K. Hamamoto, Ambassador of the U.S. to the U.N. (Sept. 30, 2016), http://www.ohchr.org/Documents/Issues/Opinion/Legislation/USA_9_2016.pdf. See generally Regulations.gov, Public Comments the CBP’s Information Collection Req’t Concerning the Arrival and Departure Record, https://www.regulations.gov/docketBrowser?rpp=25&so=DESC&sb=commentDueDate&po=0&D=USCBP-2007-0102. 107. Press Release, CAIR Florida, CAIR-FL files 10 complaints with CBP After the Agency Targeted and Questioned American-Muslims About Religious and Political Views (Jan. 18, 2017), https://www.cairflorida.org/newsroom/press-releases/720-cair-fl-files-10-complaints-with-cbp-after-the-agency-targeted-and-questioned-american-muslims-about-religious-and-political-views.html. See also Sophia Cope, Fear Materialized: Border Agents Demand Social Media Data From Americans (Jan. 25, 2017), https://www.eff.org/deeplinks/2017/01/fear-materialized-border-agents-demand-social-media-data-americans. 108. See Sophia Cope, Border Security Overreach Continues: DHS Wants Social Media Login Information (Feb. 10, 2017), https://www.eff.org/deeplinks/2017/02/border-security-overreach-continues-dhs-wants-social-media-login-information. 109. This is because software often leaves copies and references to files it is working with in unexpected places, where an expert could then easily discover unprotected information about the protected files. For example, a word processor may make unencrypted temporary copies of a document that was stored in an encrypted virtual folder, or an operating system may make unencrypted thumbnail copies of images, or any application may list names of encrypted files in a “Recent Documents” feature. 110. Since Marshmallow, all Google-licensed devices (which include Google apps) should include encryption and turn it on by default. Other Android devices should include an encryption option, unless the manufacturer has deliberately removed or disabled it, but may not have it turned on by default. 112. Microsoft sells each version of Windows in several “Editions.” Some omit support for BitLocker. Since Windows 8.1, all editions have also included a “device encryption” feature, which is an alternative to BitLocker, and only works on supported hardware. Some versions of Windows also include the “Encrypted Filesystem” (EFS) feature. 113. See Micah Lee, Recently Bought a Windows Computer? Microsoft Probably Has Your Encryption Key, The Intercept (Dec. 28, 2015), https://theintercept.com/2015/12/28/recently-bought-a-windows-computer-microsoft-probably-has-your-encryption-key/. Depending on the Windows edition in question, you can either turn on device encryption without sending the recovery key to Microsoft, or log in to a Microsoft service to ask Microsoft to delete its copy of your recovery key. 114. Wikipedia offers a comparison of disk encryption tools, both built-in and third-party. See Comparison of Disk Encryption Software, Wikipedia, https://en.wikipedia.org/wiki/Comparison_of_disk_encryption_software. 115. MacOS X versions since Panther  included the original FileVault, which is not classified as full-disk encryption but should still be used if your device supports it. 116. On most Linux systems, full-disk encryption can only be enabled when you first install the operating system. If you have a Linux system without encryption, you’ll generally need to reinstall the operating system to activate it. 117. For example, recent iOS devices are already using encryption even if you don’t specifically ask them to. Thus, while you might want to upgrade your password, check your screen lock settings, and disable Touch ID, you don’t need to do anything to turn on encryption on these devices. 118. If you want, the backups can be encrypted too—but again, please be careful not to lock yourself out of every copy of your data by forgetting your passwords. 119. Password security advice has often suggested that you never write down a password, but a more recent consensus is that writing down passwords can be a good tradeoff to deal with the risk of forgetting them. A refinement to the old advice is not to write down your password in the same place where the device it protects is kept. 121. In the past, security guides often suggested that it was necessary to overwrite multiple times (or “passes”). This may be true to some extent for flash media, as described below, but is apparently no longer true for traditional magnetic hard drives. See National Institute of Standards and Technology, NIST Special Publication 800-88, Revision 1, “Guidelines for Media Sanitization” (Dec. 2014) (“For storage devices containing magnetic media, a single overwrite pass with a fixed pattern such as binary zeroes typically hinders recovery of data even if state of the art laboratory techniques are applied to attempt to retrieve the data.”). 122. Typically, it’s run with the command line CIPHER /W C:\ from a Windows command prompt. 124. Because of a technology called wear leveling, overwriting may not reliably delete these kinds of storage media in full. This technology tries to spread out where things are stored to prevent any one part of the storage medium from being used more than another part. Researchers have shown that even after the entire device has been overwritten, wear leveling may leave a small, random portion of the data on such media, and such data is recoverable. This forensic technique may require physically taking the storage medium itself apart, and does not appear to be in common use.